If you want to protect your family from indoor air pollution and save money on your energy bills, the Breathe EZ Air Cleaner is an excellent way to clean the air. Indoor air pollution, sometimes referred to as "sick building syndrome," can cause health problems such as asthma, headaches, skin rashes, eye irritation, allergies and respiratory ailments. Indoor air quality is extremely important to your family's health. Here at Precision Air, we specialize in solutions to improve the air quality in your home. That's why we provide our customers with a state-of-the-art air cleaning device - the Breathe EZ Air Cleaner. Contact us today to schedule an installation estimate, or continue reading to learn more about the benefits of our product versus a standard air filter. A standard furnace air filter won't trap microscopic dust particles, mold spores, allergens, airborne bacteria, volatile organic compounds (VOCs) and unpleasant odors. Instead, this primitive filter allows your HVAC system to distribute indoor air pollutants throughout the house. Here's why: A standard air filter is designed to protect the blower motor that powers your forced air system, not your lungs. This filter traps only large dust particles that can accumulate on fan blades and bearings and cause the blower to fail prematurely. More-expensive electrostatic and pleated air filters, available at your hardware store, can trap some of the smaller particles that pass through a standard air filter. They use static cling and/or a tight weave to achieve filtration. The trouble with these air filters is that they quickly become clogged, diminishing air flow while straining the blower motor, thus driving up your energy bills. Replacing these filters when they get dirty is expensive and irritating. Fortunately, there's a way to trap airborne pollutants without paying for expensive air filters that clog up quickly and must be replaced frequently. Building scientists discovered that electronic air filtration can trap airborne pollutants effectively without clogging the filter media. The Breathe EZ Air Cleaner is one of the best examples of this new technology. The Breathe EZ Air Cleaner doesn't work by trapping dust particles in a super-fine fabric. It's actually an electrically powered air cleaner that charges small and large particles and pulls them to its fiberglass media. Particles that enter the filter are given an electric charge that makes them "cling" to filter media that is charged in the opposite way. This dust-trapping technique can work very effectively with an open-weave filter media that doesn't restrict air flow through your unit, thus saving you money on energy bills! Breathe EZ is also infused with carbon strips that absorb odors and chemicals commonly found in your indoor air. Learn how the Breathe EZ Air Cleaner can help reduce radon health risks. Radon gas can't be filtered, but air filtration can reduce health risks linked to radon exposure. When radon decays, it produces solid elements that stick to surfaces, such as dust particles. Breathing these dust particles can increase your risk of getting lung cancer, unless they are filtered. The problem is these particles are much smaller than what traditional furnace filters are designed to handle. The solution is the Breathe EZ Air Cleaner. In clinical trials, this air cleaner filtered 98% of radioactive elements in the air. It can be easily installed into your furnace's 1-inch filter space by a trained installer. All you need to do is make sure the air in your home is circulating through your HVAC system. The harmful radon decay particles will attach themselves to the Breathe EZ air cleaner, reducing your risk of lung cancer. If you have high radon levels, we recommend installing a radon mitigation system as your first line of defense, and the Breathe EZ Air Cleaner for added protection. The Breathe EZ Air Cleaner is available in different sizes, so it can readily replace a conventional HVAC system air filter. Our technicians are trained to install Breathe EZ in your existing HVAC system. We will also show you how to swap out the filter media inside the Breathe EZ in minutes. It's a very simple process you can do yourself on a quarterly basis. 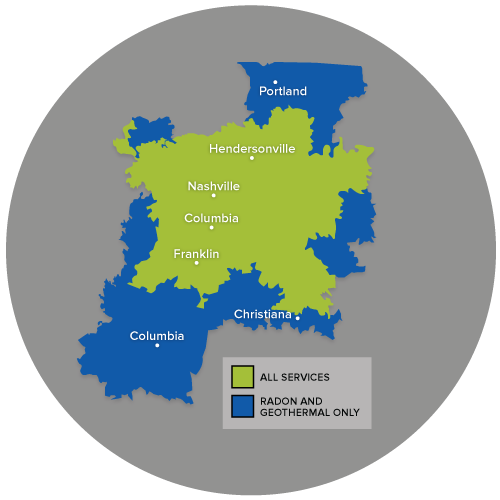 Our indoor air quality services are available in Antioch, Hendersonville, Brentwood, Smyrna, Lascassas, Madison, Hermitage and throughout Tennessee. Call us or get an online estimate to install our indoor air cleaner in your home today!